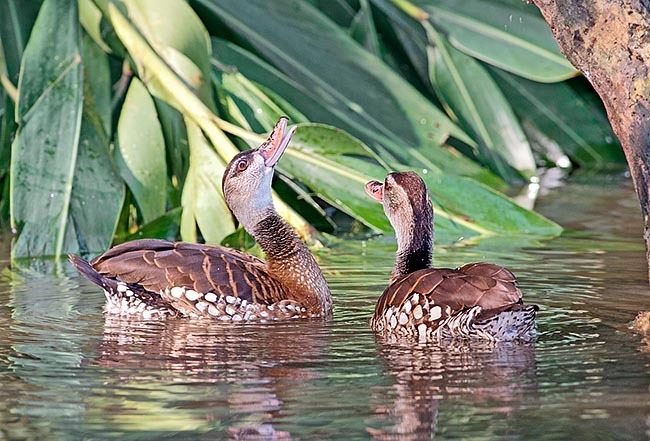 The Spotted whistling duck or Spotted tree duck (Dendrocygna guttata Schlegel 1866) is probably the least known of the ducks belonging to the group called “dendrocygna”, belonging to the order of the Anseriforms (Anseriformes), to the family of the Anatids (Anatidae). The name of the genus Dendrocygna comes from the Greek “dendron” = tree and the Latin “cygnus” = swan and means therefore “arboreal swan” in reference to the arboreal habits of most of the species belonging to this genus and in reference to the peculiar look of these ducks in some way recalling some small swans. 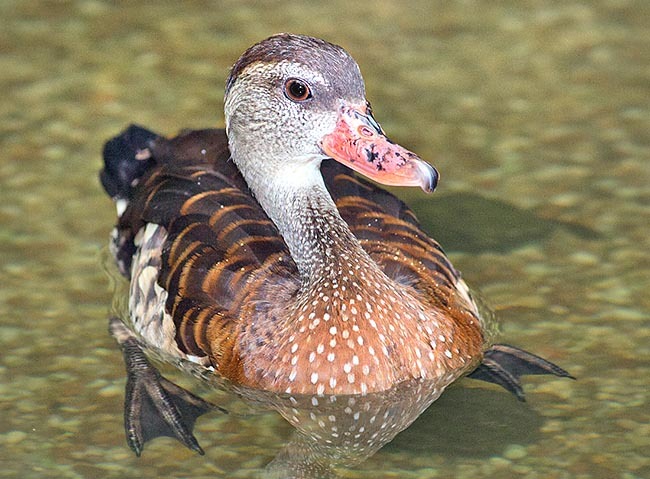 The name of the species “guttata” comes from the Latin “guttatus” = dotted, streaked, spotted, in reference to the evident roundish white spots present on the sides of the body of this duck. This species occupies a fairly vast insular range extending from the Eastern Indies (southern Philippines, central part of Indonesia) up to New Guinea. The population has recently colonized Australia with a small population resident in Weipa, on the western coast of the peninsula of Cape York. It usually frequents swampy locations, marshes, lakes and ponds. The preferred humid zones are those characterized by trees and small trees scattered along the banks and that allow these ducks to perch close and over the water. Being probably the only species of tree-ducks mainly arboreal, the nesting couples, for the spawning, depend on the presence of good-sized trees grown close to the water and having suitable hollows. The difference between male and female is by sure not evident in this genus of anatids (Dendrocygna spp. ), also if at times the attitudes and the heavier and more rounded shapes (of the lower abdomen) of the females before spawning (or while spawning), may allow an “experienced eye” to distinguish them. These ducks have a particular conformation: elongated neck and paws, great webbed feet equipped with robust and sharp nails, well erect posture with more verticalized trunk for the ducks, their rather “raised from the ground” walking is elegant, refined and graceful. Fairly short, wide, roundish wings with equally long primaries and secondaries do characterize the genus. Some species have the inner vanes of the outer primary feathers strongly jagged and serrated; they emit vibrations when flying and generate distinctive whistles or mechanical hums which may be specific of the species. When, flying, the tree-ducks keep head and neck slightly low and spread ahead, this posture makes them seem rather humped. The paws, long (more than the tail, short), make them look like if when flying they have a long pointed tail. They have a flight with rather slow and deep beats of the wings, the flight is a little flickering and very beautiful. Many species fly also in conditions of scarce luminosity (also by night). 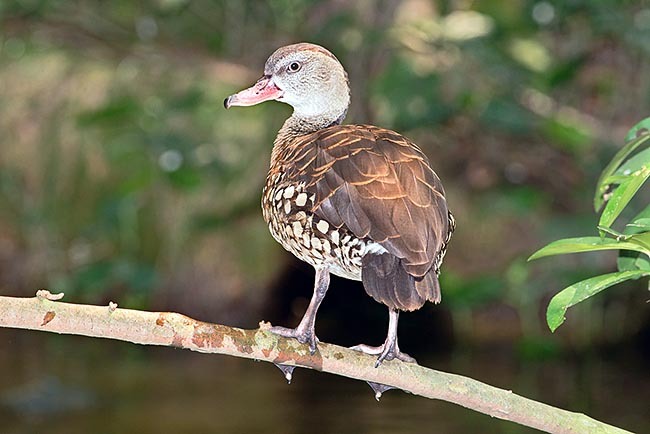 The spotted whistling duck vaguely looks like a mini version of the Cuban tree-duck or West Indian whistling duck (Dendrocygna arborea). Its length is of 42-50 cm, the wingspan is of about 85-95 cm and the weight is of about 600-850 g.
This duck is called spotted tree-duck due to the characteristic and big roundish white spots present on the feathers of the sides, of the chest and of the neck; but the spotting is not always evident in the specimens when observed from far away. Overall, it has an inconspicuous livery formed by several shades of brown. The largest spots, mostly white and dark edged are those on the sides; the spots of the neck and the chest are smaller and more nuanced until they disappear. The dorsal coverts are dark brown edged of reddish brown. The chest, especially laterally, is nuanced of reddish. The throat, the cheeks and the very first part of the neck in continuation of the head, are pale grey with more whitish shades at the level of the ventral cheek-chinstrap and with dark brown shades at the level of the eye, crossed by a short dark stripe. The abdomen is whitish cinnamon with a light hinted and nuanced spotting. On the head, which has a blackish-dark brown vertex, is present a small and inconspicuous small tuft of feathers kept often partially erect and which brusquely interrupts (when raised). The feathers of the wings, of the tail and of the under-wing are dark brown. The rather massive bill is of dark grey colour with pink or mottled ping under colour (in some specimens the pink is paler and more evident). The paws are dark grey shaded of fleshy-dark pink colour. The expressive eyes have dark irides. The sexes are similar. The juveniles have duller liveries and less spotted than the adults. 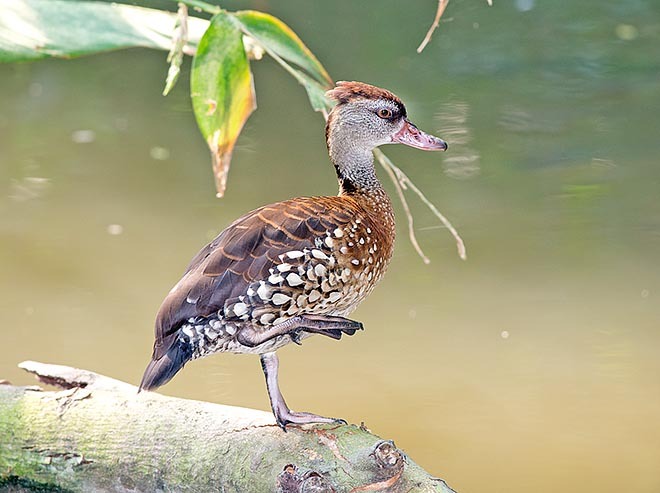 This species of tree-duck is the least known of its own genus also due to the fact of having been the last of the species belonging to the genus Dendrocygna to be discovered and described starting from 1852. It is a sedentary duck and has a character that can be confident and at times even almost audacious. This tree-duck normally emits less vocalization than the other species of its own genus, even if couples kept in captivity in reality have proven to be very noisy. When flying, the spotted tree-ducks emit a strong and characteristic hiss-hum-whistle caused by the fast passage of the air through the deep margins of the primary remiges. This species is a skilled swimmer and underwater diver as it can remain under water of 20 and more seconds; when it plunges it does, with vigour, a dive ahead keeping the wings strongly pressed against the body. They are ducks which love to stay and rest perched on the shaded banks, on branches and the trees with horizontal structure protruding over the water, on the trunks emerging from the waters and on the floating and fluctuating vegetation. The often live in pair or in small groups even mixed to other species of ducks. Like the other species of the same genus, they may have the habit of nourishing and resting in group even if not prone to form huge flocks and great concentrations of specimens, typical of the other species of tree-ducks. In any case, also for this species, have been observed flocks of even hundreds of specimens who, when the daylight lessens or even well after the sunset, can fly gathering on the tops of the high trees deemed suitable for the night rest; the same number of animals, in the morning, may proceed to the same areas of grazing. The alimentation is similar to that of the other species of tree-ducks, that is omnivorous, as they can nourish of aquatic plants as well as of plants and seeds growing on the banks and integrating the diet especially with invertebrates, in particular molluscs, and of various small animals. The reproductive season is fairly long and probably starts by the beginning of the rain season in September; hatches with newborn ducklings have been observed, in southern New Guinea, between December and April. The bonds of the pair appear to be fairly lasting. The spawning is formed by 8-15 white-ivory-cream coloured eggs and the incubation lasts about 25-28 days. The ducklings are dark brown with yellowish ventral parts; yellow are also two stripes on the back, some lines in correspondence with the wings and some ample lateral lines of the head and supra-ciliary which determinate a colouration recalling that of a bumblebee (Bombus spp.). The young reach the age of the fly off and their independency when about 45-50 days old. The species results quite well present in its own range; numerous in some parts of Indonesia and stands among the most commons wild birds of New Guinea. Nevertheless, the loss of humid zones due to an intensive agriculture is worrying; conversely, the species does not seem, luckily, to be subjected to an intense hunting pressure. The population is estimated to amount to 1-2 tens of thousands of individuals. 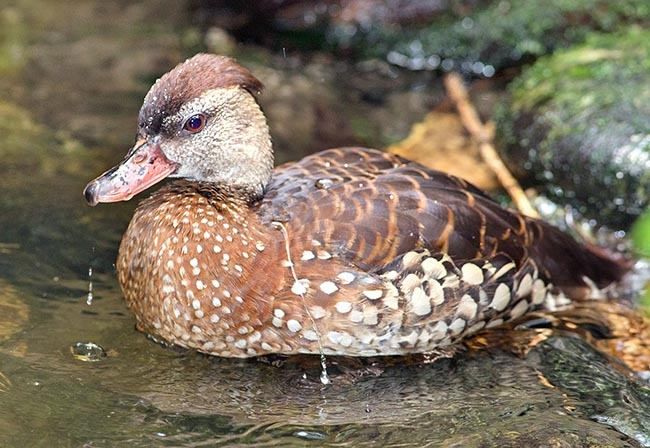 Although the spotted tree-duck, like all tree-ducks, is a graceful species and endearing to breed, it is still now rather scarce in the ornamental aviaries.